In the next holiday, you must visit Belitung Island. Why is that? It is a perfect place for relaxation. As for reference, there is Mempayak Lake. It has an equal popularity to Blue Kaolin Lake. No wonder, many tourists come there over time. The lake features many charming views such as clear water, green hills, and cool atmosphere. You can simply sit and relax near to the lake. It may exterminate all of your stresses. Where is it, actually? It is located in Mempayak Village. The lake belongs to Manggar District. Here is the thing. Mempayak Lake is not a natural site. It was a location for tin mining. Despite this fact, it is a worthy place for a vacation retreat. In terms of beauty, it is equal to other lakes in Belitung. It emits stunning views, too. Near to the lake, there are shady shrubs. The breezy wind makes this place quite comfortable. If you want to relax, there are several gazebos in the midst of thick trees. Another feature is the local food stands or “warungs”. You can buy drinks or foods there. Even though it has an inferior beauty to Kaolin Lake, it emits a soothing nuance. The water is moderate. Several waterweeds are seen on the surface of the lake. That means some parts of Mempayak Lake are shallow. In the horizon, you are able to see a majestic panorama of Burung Mandi Hill. It is a perfect background, isn’t it? All these features make a perfect spot for sightseeing. If you want to relax, there is a shady location on the right side of the lake. Most of the time, Mempayak Lake seems quiet. If you want a merrier situation, you must come during a local event. There are several events like a raft racing. The best time to visit Mempayak is during the Indonesian’s Independence Day celebration. You can expect numerous contests at that time. What’s more? Some tourists visit the lake for relaxation. No wonder, there is an area for resting. It features gazebos, too. You can simply relax on them while enjoying beautiful views of the lake. Visiting Mempayak Lake is worth an experience. The location is accessible and it is surrounded by beautiful natural ornaments. The combination of bright blue sky and green hills is indeed satisfying. In some occasions, you may hear the sounds of nature like birds’ songs. The rattles of insects are also soothing. 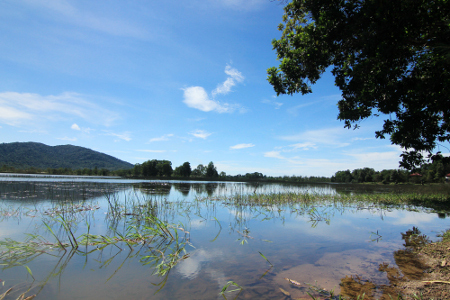 In a nutshell, the lake is recommended nature tourism in Manggar. If you come to that district, you should stop by there. Your start point is Tanjung Pandan City. From here, you should head to Manggar District. It is better to ride a car since it is more comfortable than other types of transportation. Once you have arrived in Manggar, it is time to head to Mempayak Village. The lake is situated near to such settlement. If you come from Hanandjoedin Airport, the trip takes 50 km to Manggar.